Beautiful mountain ville with waterfall hikes, gardens & a place for relaxation. Property 1: Beautiful mountain ville with waterfall hikes, gardens & a place for relaxation. The million dollar view of Jarabacoa's Mountain, Valley and nearby cities. 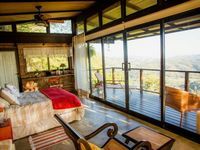 Property 4: The million dollar view of Jarabacoa's Mountain, Valley and nearby cities. 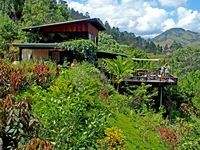 Property 7: Villa Laura Jarabacoa, Family Village located in the mountain town of Jaranacoa. Property 12: Letti s villa a paradise in the nature! El Sueño Villa, cabin in the woods. Property 32: El Sueño Villa, cabin in the woods. The trip was amazing and I loved Casa del Fuego! It was so nice to be somewhere quiet and peaceful. Jacques was a delight - he made sure that we were comfortable as well! It rained last night and that added to the ambience. Today we made our way to the waterfalls..and although I didn't go all the way to the top, my friends tell me Jacques was invaluable with helping them find their way up there! I sat at the lower falls, took pictures and meditated instead. Casa del Fuego had everything we needed to be comfortable. Even the resident outdoor cat was welcoming!